The Irish Times lead editorial today about the aftermath of the recent papal visit. “Pope Francis has returned to Rome after his brief visit to Ireland where he charmed with his humility and his plea for forgiveness over the sexual abuse of children by Catholic priests and its cover-up by bishops. Yet, nothing has changed. As the afterglow of that visit recedes, a Vatican emerges once more where things are as was. There, inadequate mechanisms for holding to account those prelates who cover up the abuse of children remain. This is unacceptable”. “If the Catholic Church does not address accountability in a manner which ensures children are safe, then the international community should intervene to help it do so”. One way would be for the United Nations to cease its recognition of The Holy See (The Vatican) as a state with a seat at the UN. This anomaly in the world order begs the question why no seat at the UN for the other major religions of the world? Here is the text of the letter sent by Minister for Children and Youth Affairs, Katherine Zappone, to Pope Francis (as head of the Vatican) regarding the Tuam babies scandal. 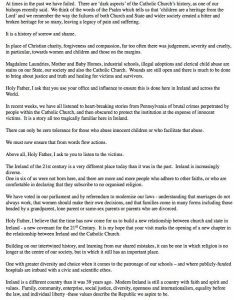 As Minister for Children and Youth Affairs and an Independent Minister of the Government of Ireland I am writing to you in the hope that the church will accept its responsibilities and make reparation for its part in a very shameful chapter of Irish history. Mother and Baby Homes came to public attention in Ireland during the summer of 2014 following a series of disturbing reports of high mortality rates and claims of possible burials of children on the grounds of a former home in Tuam Co. Galway. The then Government decided to have these matters investigated and a statutory Commission of Investigation was established in February 2015. 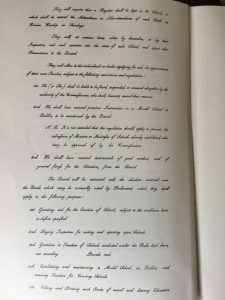 The Commission has been examining a wide range of concerns related to the institutional care of unmarried mothers and their babies during the period 1922 to 1998. The Commission is examining 14 Mother and Baby Homes and 4 County Homes. It will in time provide a full account of what happened to vulnerable women and children in these institutions; how they came to be there; and the pathways they took as they left. An early focus of the Commission’s work was to examine the Tuam site to address questions about the alleged internment of human remains. As part of this process, the Commission conducted a series of surveys and test excavations, commencing in October 2016. I visited the site myself and met former residents and relatives shortly before these works commenced. The statutory Commission of Investigation confirmed the presence of human remains on the site of the former Bon Secours Mother and Baby Home in Tuam. The Home was run by the Bon Secours Sisters from 1925-1961 in what was previously a workhouse dating back to famine times. In the 1970’s the former home was demolished to make way for a local authority housing estate. A small memorial garden is maintained by local residents and there is also a children’s playground on the site. The Commission’s excavations have revealed that human remains are visible in a series of chambers that may have formed part of sewage treatment works for the Home. The Commission believes that there are a significant number of children’s remains there. It recovered some juvenile remains for detailed forensic analysis. From this analysis, it has determined that the remains are between 35 foetal weeks and 2 to 3 years of age. From carbon dating it has correlated the age of these samples with the time period during which the home was in operation – between 1925 and 1961. This news was met with widespread disgust both in Ireland and abroad. There were suspicions about burials of this kind in Tuam for some time.. However, it is fair to say that the confirmation received from the Commission of Investigation caused many people to demand that dignity and respect be afforded to the memory of the children who lived their short lives in this Home. We also owe it to the families of these children to now do the right thing by their loved ones. We have now put in place a series of actions to ensure that we have an appropriate and respectful response to the discovery. Since then, I have instructed an expert team to do further work on the site to determine the options that are open to us to fulfil our duty to these children. The team has reported offering options including a complete excavation of the site and DNA analysis of the hundreds of remains contained therein. A consultation has also been carried out with survivors and local residents about what they would like to see happen on the site in Tuam. There was little compassion shown to children and their mothers in this home. We cannot change what happened to them. For the little ones whose remains are in a sewage system, we owe them dignity in death. For their mothers, siblings and families we need to give them some peace. 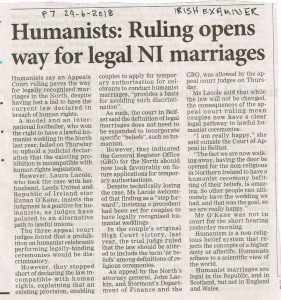 It is my strong conviction that given the role of the Church in this shameful chapter of recent Irish history it must play a practical role in addressing the hurt and damage. I believe that the church should contribute substantially to the cost of whatever option is decided by the government. This should be done willingly, unconditionally and quickly. Nothing less will demonstrate remorse. Here is a link to a YouTube video of the address by An Taoiseach, Dr. Leo Varadkar, to Pope Francis delivered on Saturday 25 August. 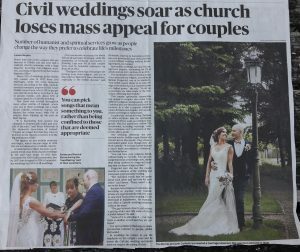 This is an article by Louise Neylon showing how marriage has changed in Ireland in recent years. The changes have implications for education policy at primary level (National Schools) in the context of the patronage (ownership and control) of our schools in the near future. 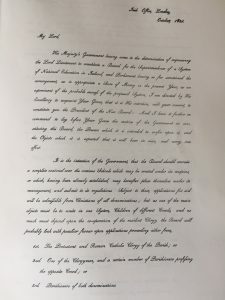 These three pages comprise a facsimile of the letter (October 1831) from Chief Secretary (Ireland), Edward Stanley, to the Duke of Leinster (senior Irish peer) to appoint him President of the Commissioners of National Education under instructions from the imperial government. 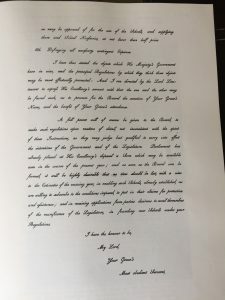 The Stanley Letter sets out the precepts for the National School system. This is the text (as amended) of the Education (Admission to Schools) Bill, 2016. However there are no penalties attaching to any patron body or board of management for failure to observe the provisions in the Bill.